Whether it�s your first time working on a motorcycle or you do it for a living, it pays to have a trusted source of information to ensure you get the job done right. The BMW motorcycle repair manuals we sell are the best available, providing everything you need to better understand your vehicle and how to service and maintain it. With a BMW motorcycle manual from The Motor Bookstore at your disposal, you�ll be more in tune with your cherished ride than ever, and you can avoid the expense of paying for professional repair services. These BMW motorcycle manuals are intended for people like you, DIY mechanics who like to work on their Beemers. They feature sequential teardown and reassembly procedures, both written and in photos, so you can repair, service or maintain your BMW motorcycle in your own garage. You already know almost everything there is to about how to operate your motorcycle. Now you�ll have access to the information you need to perform basic maintenance and tune-ups, troubleshoot and replace failing parts and upgrade and enhance key components. These service manuals are written in ways that are easy for anyone to follow, yet they provide thorough technical details and professional tips that benefit even the most experienced mechanics. We offer BMW motorcycle manuals by Clymer and Haynes, trusted names in the DIY field for decades. The books they publish are written by teams of industry experts who have hands-on experience working on all types of motorcycles. In addition to step-by-step instructions and clear visuals, our BMW motorcycle service manuals come complete with sections on diagnosing issues, model histories, pre-ride checklists, tips, time-saving shortcuts and more. You can fix your Beemer! Actually, with assistance from the right BMW motorcycle manual, you can also restore a BMW motorcycle � to Concours d'Elegance standards if you want to. But even if all you want to do is simply maintain your bike in good running condition, one of the many motorcycle repair manuals we offer at The Motor Bookstore, will help you with that and much more. You will be able to perform service chores such as oil changes, replacing the air filter, cleaning or replacing the spark plugs, to more advanced tasks, such as engine tune-up all the way to engine and transmission rebuild. So get the right BMW motorcycle repair manual, and do the job right. Contact us online, on the phone or by email for more information and to place your order for a BMW motorcycle repair manual today. 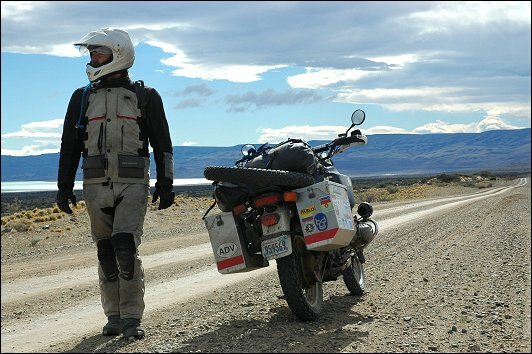 Above: Spencer Harris of Seattle WA, and his 1981 BMW R80 somewhere on Ruta 40 in Patagonia, Argentina.